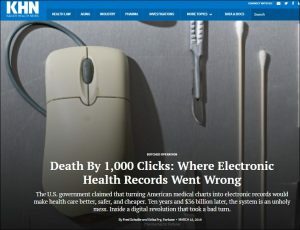 [I]nstead of streamlining medicine, the government’s EHR initiative has created a host of largely unacknowledged patient safety risks. 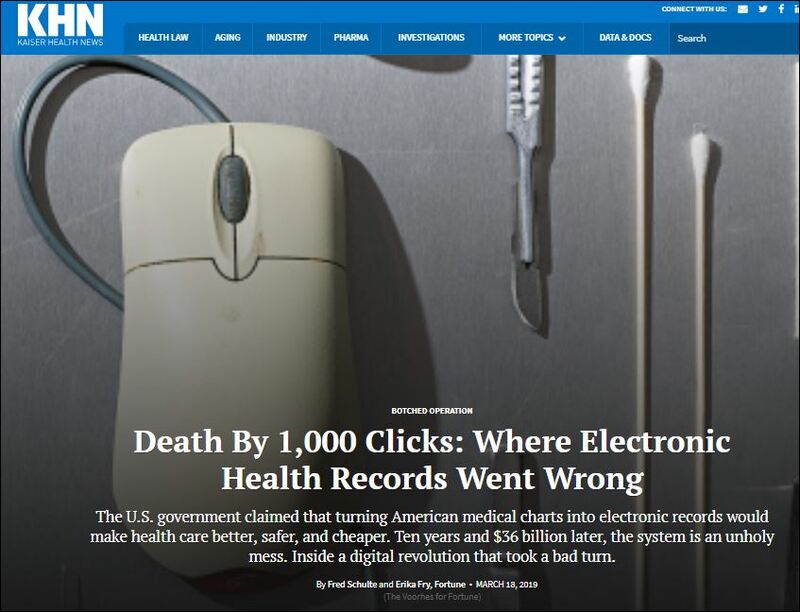 Our investigation found that alarming reports of patient deaths, serious injuries and near misses — thousands of them — tied to software glitches, user errors or other flaws have piled up, largely unseen, in various government-funded and private repositories. Compounding the problem are entrenched secrecy policies that continue to keep software failures out of public view. EHR vendors often impose contractual ‘gag clauses’ that discourage buyers from speaking out about safety issues and disastrous software installations — though some customers have taken to the courts to air their grievances. Plaintiffs, moreover, say hospitals often fight to withhold records from injured patients or their families. Let’s back up and provide the context included in this investigation. The Obama Administration, as part of the Affordable Care Act, not only sought to increase health insurance coverage for tens of millions of middle class and poorer Americans, officials also wanted to deal with skyrocketing medical costs. Americans spend more than $3.6 trillion annually on health care expenses, and it’s no secret that staggering inefficiencies not only boost costs, they also undercut the quality and safety of care. Recent reports again find that this country spends more for medical services than other western industrialized nations but gets poorer outcomes. A huge frustration for patients and providers always has involved medical records, which long had become a blizzard of paperwork, including cryptic notes scrawled by doctors. Patients were entitled to copies of their records (which the savviest of them got, stat) but often were shocked to find what was in them—errors, duplications, and extraneous materials. EHRs were supposed to take the best capacities of the cyber age and hurl medicine into the 21st century in dealing with what, essentially, was Big Data. The Obama Administration funneled major sums into an EHR initiative, which has led to wide adoption of electronic records systems. But doctors and hospitals fought the ACA. Hospitals, in particular, put their financial interests in a prime position in development of giant, costly, and complex records systems. No one blinked when EHRs were set up to benefit most medical billing systems, incorporating daunting codes, arrays of procedures and drugs that needed to be charged for, and allowing an army of staffers access to systems that had been the domain of doctors and nurses. Systems were tailored a great expense to institutions, and they centralized vast collections of information. They also lacked “interoperability,” meaning that systems at one place couldn’t talk to those at others or share crucial information. Harried medical staff, meantime, not only never embraced EHRs, they chafed at working with them. As the New Yorker magazine recently reported, doctors learned to hate computers. Quantros, a private health care analytics firm, said it has logged 18,000 EHR-related safety events from 2007 through 2018, 3 percent of which resulted in patient harm, including seven deaths — a figure that a Quantros director said is ‘drastically underreported.’ A 2016 study by The Leapfrog Group, a patient-safety watchdog based in Washington, D.C., found that the medication-ordering function of hospital EHRs — a feature required by the government for certification but often configured differently in each system — failed to flag potentially harmful drug orders in 39 percent of cases in a test simulation. In 13 percent of those cases, the mistake could have been fatal. The Pew Charitable Trusts has, for the past few years, run an EHR safety project, taking aim at issues like usability and patient matching — the process of linking the correct medical record to the correct patient — a seemingly basic task at which the systems, even when made by the same EHR vendor, often fail. At some institutions, according to Pew, such matching was accurate only 50 percent of the time. Patients have discovered mistakes as well: A January survey by the Kaiser Family Foundation found that 1 in 5 patients spotted an error in their electronic medical records … The Joint Commission, which certifies hospitals, has sounded alarms about a number of issues, including false alarms — which account for between 85 and 99 percent of EHR and medical device alerts. (One study by researchers at Oregon Health & Science University estimated that the average clinician working in the intensive care unit may be exposed to up to 7,000 passive alerts per day.) Such over-warning can be dangerous. From 2014 to 2018, the commission tallied 170 mostly voluntary reports of patient harm related to alarm management and alert fatigue — the phenomenon in which health workers, so overloaded with unnecessary warnings, ignore the occasional meaningful one. Of those 170 incidents, 101 resulted in patient deaths. The Pennsylvania Patient Safety Authority, an independent state agency that collects information about adverse events and incidents, counted 775 ‘laboratory-test problems’ related to health IT from January 2016 to December 2017. This is not good. In my practice, I see not only the harms that patients suffer while seeking medical services, but also their struggles to access and afford safe, efficient, and excellent medical care. Their challenges have exploded as the costs skyrocket and the complexities and uncertainties soar for treatments and prescription medications, too many of which turn out to be dangerous drugs. As mentioned, one of the first and foremost thing that patients can do to protect themselves and improve their medical care, I have found, is to get and pore over their own medical records. This isn’t as convenient as it is supposed to be and often takes too long. But Uncle Sam and the law are on your side, in insisting that the process should be easy and low-cost. Once you have your records, you’ll get an eye-opening and new view of your doctors and your care. Talk to your providers, correct errors and misapprehensions, and stay atop those records to ensure, for example, that doctors don’t order duplicative tests or procedures, or that nurses and other clinical staff don’t list wrong medications or treatments. KHN and Fortune decry the bollixed-up state of EHRs as a sad “missed moment,” when, with officials’ energy, enthusiasm, and financial support, medicine might have taken a leap ahead. Safety advocates, for example, envisioned how information pulled easily from electronic records could show where, when, and how patients were put at risk by institutions, treatments, and medications. Dangerous trends that took months or years for medical scientists to piece together could have been detected faster and corrected sooner, if EHRs were a major boon to diagnostics and not hospital and insurers’ bottom lines. Medical oversight committees, EHR proponents also believed, could better see which doctors veered from accepted clinical standards and practices and why. They hoped electronic systems not only would flag aberrant but dangerous doctors. It’s unacceptable that a select few, politically connected companies have raked in huge sums by making their products as hush-hush as possible, threatening doctors and medical researchers who may be trying to knock out their bugginess—and more important, to protect the safety and quality of patient care. Scott Gottlieb, the outgoing commissioner of the federal Food and Drug Administration, has responded to the investigation of EHRs by saying the systems need tougher regulatory scrutiny. It’s unclear, though, whether the agency has oversight of them, possibly as medical devices. Gottlieb also has a knack for saying right sounding things but the FDA then failing to follow up. Congress and the Trump Administration, however, must step in to ensure that the $36 billion, decade-long EHR push doesn’t shortchange taxpayers and patients.